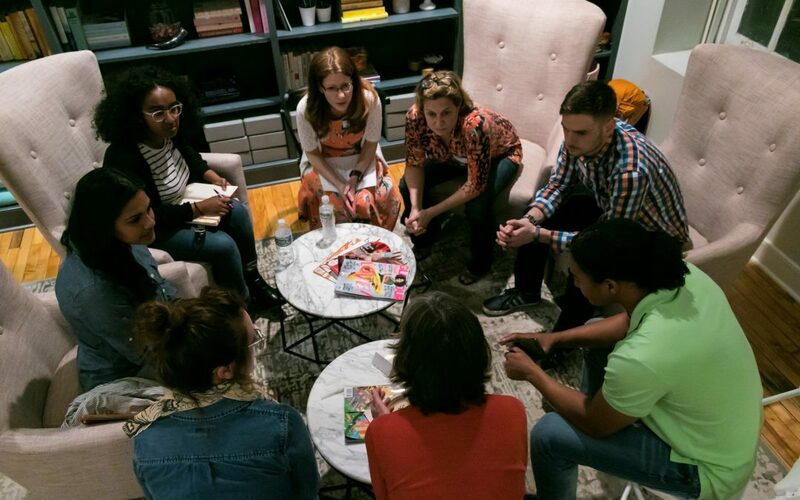 Last Tuesday we welcomed the first TEDxRVASalon of 2018, Silenced No More, hosted by the new community center making space for women, The Broad, where we discussed the reality of human trafficking in the United States and its impact right here in Richmond, VA. As attendees entered the bright and warm workspace, we kicked off 2018 with one of our most important topics since the beginning of our series. After introducing our topic, we began our evening with a talk from TEDxDayton given by Catalleya Storm: Human Trafficking– Stop The Silence. Catalleya, a now activist that was once caught in a trafficking ring, told her story and described how she was groomed and sold by someone in her life that she trusted. She later explained how she didn’t even know she was being trafficked until she was freed. A realization that surprised many of our attendees and sparked questions and concerns that they fervently discussed in our breakout groups. After our breakout sessions, we began our panel to delve deeper into the night’s topic. This gave our audience the chance to hear from individuals within our very own community who have been affected and have been working to fight against human trafficking in RVA. They spent a good portion of the panel dispelling misconceptions of the topic. Many think of the movie “Taken” or many of the other Hollywood productions on the screen. They also discussed the ease at which traffickers could obtain victims through means we usually find harmless, such as social media, online gaming, and dating apps. At times they are indoctrinated into the life and become so entwined that they begin to think of it as the norm to the point where less than 1% of those who are trafficked report their traffickers and more than 88% would not pursue prosecution. More importantly, our panelists spoke about ways to spot someone who is in danger by following your gut. “Stranger danger” has conditioned us to believe that those who are dangerous and committing these crimes are often strangers or live in underdeveloped neighborhoods, when in fact, “bad guys like to live in nice neighborhoods.” Sometimes the simplest way to establish a connection and ensure someone is safe is a simple smile to a stranger or making conversation to let the person know that they are not alone. Of all the suggestions made, the most common was to simply make a connection with fellow human beings. To feel as though they have a connection to someone outside of their situation could make all the difference. To say the night was eye opening would be an understatement. Everyone walked out of Tuesday’s talk, a little more aware and a little more open and prepared to fight this ongoing problem by utilizing resources from organizations such as impactvirginia.org and the Polaris Project in hopes to make this world a place where these victims would be Silent No More. Ryan L. Brooks – Why you should care: The human trafficking footprint in the U.S.
Be sure to check out the Richmond International Film Festival which plans to show a film on our topic. Here is an information sheet from Bon Secours on Human Trafficking and this brochure for Virginia’s 1st Youth Safety Summit.